It’s also the second time the company has pulled off a landing. SpaceX has finally landed its Falcon 9 rocket on a drone ship at sea, after launching the vehicle into space this afternoon. 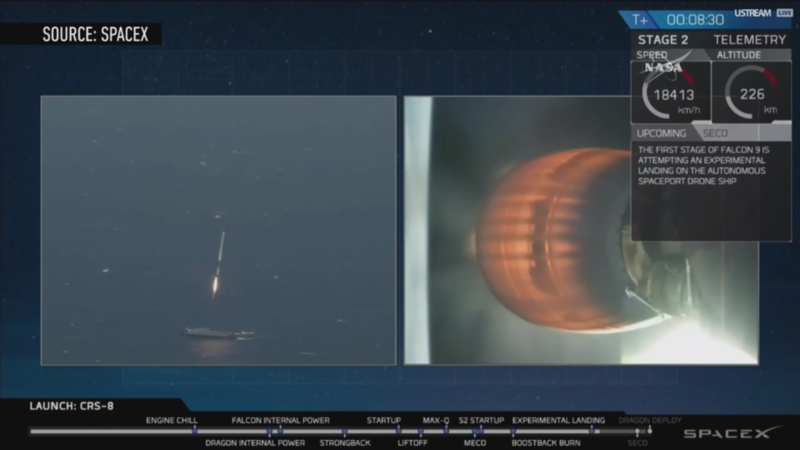 It's the first time the company has been able to pull off an ocean landing, after four previous attempts ended in failure. Today's success is a crucial milestone for SpaceX, as it shows the company can land its rockets both on solid ground and ocean. This is the second time SpaceX has successfully landed one of its rockets post-launch; the first time was in December, when the company's Falcon 9 rocket touched down at a ground-based landing site in Cape Canaveral, Florida, after putting a satellite into space. Now that SpaceX has demonstrated it can do both types of landings, the company can potentially recover and reuse even more rockets in the future. And that could mean much greater cost savings for SpaceX. Mastering the ocean landing is going to be important, since that’s the type of landing SpaceX will probably conduct more often. At a recent NASA press conference, Hans Koenigsmann, vice president of mission assurance for SpaceX, said the next two to three flights will involve drone ship landings. Ultimately, the company expects to land one-third of its rockets on land, and the rest at sea. Why does SpaceX keep focusing on these ocean landings? A drone ship floating on the ocean is a harder target to hit than a large expanse of ground, since it is smaller and floating on moving water. Plus, all of SpaceX's ocean landing attempts have resulted in the rocket exploding. Still, landing at sea can be less tricky than ground landings, and the main reason has to do with fuel. To return back to Earth, the Falcon 9 has to use the fuel leftover from takeoff to reignite its engines in a series of burns. These burns help to adjust the rocket's speed and reorient the vehicle into the right position for entering Earth's atmosphere and then landing. Different types of landing techniques require different amounts of fuel, though, and that revolves around how the Falcon 9 launches. The rocket doesn't travel straight upward into space but follows a parabolic arc up and away from the launch pad. Because of this, the rocket has to go through a lot to conduct a ground landing. The vehicle has to slow down in the direction it's heading, completely turn around, and then retread the vertical and horizontal distance it's covered to get back to the landing site. That requires a lot of extra fuel. Ocean landings aren't as complicated as that. SpaceX's drone ship can position itself in an ideal place to "catch" the vehicle on its more natural path back to Earth. That decreases the distance the rocket needs to travel, as well as the amount of fuel needed to maneuver the Falcon 9 for landing. For SpaceX missions that use up lots of fuel, performing a ground landing may not even be possible. Rockets that launch heavy payloads or go to a high orbit need extra speed during the initial ascent, and extra speed needs more fuel. Those Falcon 9s that have to reach extra high velocities don't have as much fuel leftover for the landing. That’s when the drone ship is the best — if not only — option for recovery. >The whole point of landing these rockets is to help save SpaceX money on launch costs. Right now, most rockets are destroyed or lost after they launch into space, meaning entirely new rockets must be built for each mission. SpaceX hopes to recover as many rockets as possible to cut down on cost of creating new vehicles. The Falcon 9 costs $60 million to make and only $200,000 to fuel. If a recovered rocket doesn't need too much updating and refurbishment between launches, reusability could eliminate a good chunk of that manufacturing cost. SpaceX President Gwynne Shotwell expects reusable rockets to bring down launch costs by about 30 percent, according to Space News. That would make the company's vehicles an even cheaper option for clients than it already is.